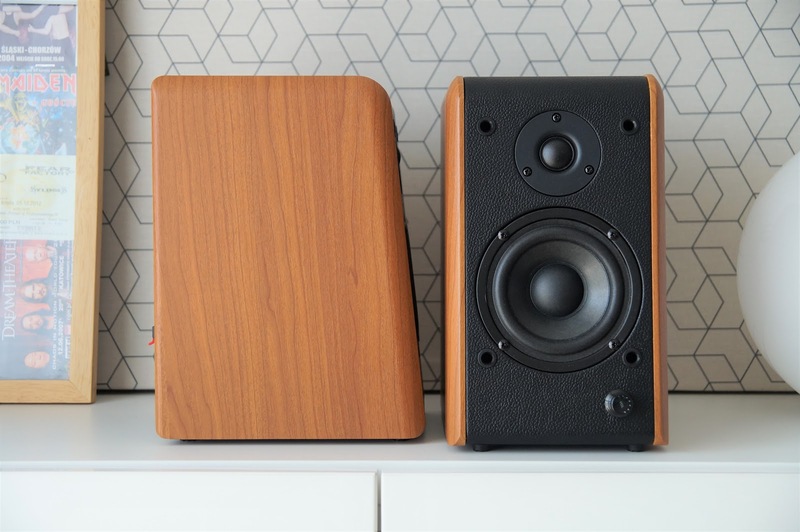 Microlab is a stylish looking speaker, which is not something I expected from them just by looking at their price. Looks of this speaker are reminiscent of Edifier S2000 Pro I reviewed recently, with their tilted aback black front panel and wooden side panels (in S2000 Pro it was a real wood, here in B77 it is just a vinyl that looks OK). Of course it is not to say B77 is at the same build quality level but it is nicely build for the price. I especially liked that all the black panels in B77 are covered in soft touch material imitating skin that significantly adds to more premium feel. What is not so premium is the grills, they look OK but I preferred the look of B77 without the grills. Sizewise they are quite big, but not too big for desktop use, they are a bit bigger in size than Edifier R1280T and R1700BT. Featurewise these are very straightforward speakers. You have a volume control dial on the front panel of master speaker and and two tone dials on its back (bass and treble). On the back there are also two pairs of RCA inputs that we can use to input the analog signal to the speakers. Inside the master speaker is hidden a 2x24W stereo amplifier powering both all the drivers via passive crossovers. Signal from master speaker to slave speaker is send via normal speaker cable. The drivers are two 4 inch paper cone woofers and two 0.75inch fabric tweeters. That is it. Lets see how they sound now. First of all, Microlab has very little hiss, definitely less than most studio monitors I tested recently. What it has in common with studio monitors is overall sound quality, which is clear, detailed and a bit forward in upper midrange. Midrange clarity and focus is one of the biggest strengths of B77's sound surpassing most of the budget speakers I tested recently, including Edifier R1280T, Mackie CR4 and likes. There is no big problems around the crossover region I could detect that would impact this crucial region (I can not say the same about Edifier R1280T for example). They are clear thanks to slight boost in upper midrange, fortunately this does not make them hard or piercing. This means they are great choice for those listening to lost of acoustic music, vocal music etc. What is also worth mentioning is that Microlab chosed to not boost the bass response drastically. This is very unusual for budget speakers, most of them goes the other way and boosts the upper bass response to give impression of deeper bass response and this usually results in bass that is very unnatural, boomy and hollow, and I just can not stand that kind of bass presentation. One of the worst examples of boosting the upper bass are Mackie CR3 and CR4 which are unusable because of the way they present bass IMO. Microlab boosted the upper bass just a little bit, but also too care in giving it good detailed and respectable reach. It is not perfect of course, actually it is weakest aspect of B77's sound, it is lacking a bit of groove and dynamic punch, but that is still better that most speakers I tested aroud this price range. Also treble presentation is good with enough details and "air", it works nicely with midrange creating coherent sound from top to bottom. B77 also creates nice, big stereo soundstage that, as usual with budget speakers, lacks depth of more expensive speakers and monitors. Powerwise B77 can play loud enough for desktop use and even for small bedroom use, but as the level rises they start to display even more "stiff" bass resulting in flat dynamics. I compared Microlab B77 with two other speakers, one is Creative T20 Series II and the other is Edifier R1280T. Creative T20 Series II is a speaker that is on the market for quite a few years now and its price makes it a direct competitor to Microlab B77. T20 have completely different size and looks, it is more compact solution with all plastic black enclosures with glossy front and yellow 2.75inch woofers. Where T20 II looks interesting and quite fun, B77 is more grown up and premium looking, it is also substantially bigger. Feature wise they are equall. Quality of sound reflects the differences in size, B77 sounds bigger and more grown up and more effortless than thryhard T20. T20 uses upper bass boost to sound bigger than it is and does it quite well for such a small speaker but more natural and effortless bass from B77 is more to my liking. The same can be said about midrange and high end, B77 is more natural, clearer and more focused, where T20 has rather dark and recessed midrange and dark sounding high end. B77 can also play much louder but that is expected from much bigger speaker with more power. Edifier R1280T is my favorite in under 100euro/dollars price range, at least until now. Unfortunately for Edifier, Microlab B77 not only is cheaper and better looking, but also sounds better especially in crucial mid ranges and high end. Edifier has an advantage of remote control with the rest of features equal and superior, "fatter" bass response, especially useful when listening to electronic music or hip hop for example. B77 has more restrained bass response, definitely more neutral and better integrated with the rest of spectrum, the rest of spectrum that in also more natural and neutral in presentation. Midrange in B77 is more coherent and focused and high end is more detailed and airy. Edifier has more power and punch and is able to play louder though. So, all in all, Microlab B77 takes the crown of best budget audiophile speaker for less than 100dollars/euro from Edifier R1280T. Microlab B77 fulfilled all the promises. It is a great speaker that I can recommend to anyone looking for their first "audiophile" speaker for very little money, so if You are looking for Your first desktop speaker for under 100euro/dollar than You should definitely give B77 a listen (as long as it is available in Your country, of course). Great value for money, highly recommended. Completely according to the analysis of both. Greetings and go ahead with the comparisons that really are very professional and useful when choosing a speaker according to their characteristics. Can I ask why would you pick R1700BT over B77? I am looking for speakers to small room. Listening to blues, rock and metal and wathcing movies (80:20 for music over movies) I am considering the B77 but my budget goes around 200 dollars/euros. So what would you recommned to me? Thanks for the review! The video with audio comparison was the definite indicator to buy the B77. Hi Michal, keep up the good wotk! I would like to see (if possible) a comparison between the Woxter DL-410, wich seem a pretty bad choice, but their sound, once tweaked (bass max and treble 3/4) is quite convicing. Will it be possible for you to compare them against the B77/T20/T40 or the 1280´s? I think you´ll be suprised. It has quite a flat response that makes them sound like reference monitors... for their price I mean. They have quite a reputation on some forums as I saw.